Rome wasn’t built in a day; nor was the SoCal Viper Club. The folks who have donated their time to take on the leadership of the SoCal Viper Club have done so out of love of the Viper and a desire to promote the driving experience of the Vipers. With Vipers having no traction control up through 2011, and so much torque and power, the SoCal Viper Club has always been passionate about helping Viper owners learn how to safely drive their cars. The Car Control Clinic has become a popular annual event that helps Viper owners learn their limits with these cars. The many track, social and driving events the SoCal Viper Club provides throughout each year gives all members an opportunity to enjoy and learn about their cars as well as to socialize with other Viper owners. OUR TEAM WORKS VERY HARD TO KEEP YOU ENTERTAINED WITH YOUR VIPER CLUB EXPERIENCE THROUGHOUT THE YEAR. My name is Gary Belvedere, I’m 56 years young, married to my loving wife Melissa for 32 years. We have a soon to be 30-year-old daughter, Shawnae, and a 27-year-old son, Jake. I’ve been an Electrician for 38 years and enjoy traveling with my wife, hunting, motorcycle riding, off-roading, and boating at our vacation home in Lake Havasu Arizona. Melissa and I have been members of the Southern California Viper Club since 2003. We’ve enjoyed many great events and activities of the club, met and enjoyed the company of Viper members from all over the world, and now find the time to give back a little by serving as your Club V.P. Hi, my name is Michael and I’m honored to serve as your club treasurer. I was asked, why a Viper? Because it’s not Corvette. Hang on, can I say that here? The Viper, particularly the blue and white GTS, has been my dream car since I was reading car magazines during high school classes. I’m also a proud father of a 6 year old and a 3 year old who crack me up daily, and husband to an amazing wife that challenges me to be a better person. When I’m not playing around with the car, I tend to clients’ financial plans and portfolios as their Certified Financial Planner. I’m looking forward to future adventures with club members and Viper owners, new and old. See you on the road! Albert Fattal, former founder of AlFa Logics (a computer technology and software company) has worked in the applied computer aerospace metrology and analysis sector for over 8 years where he applied organizational skills to mold an entire production-quality system into a unified manageable computer automated account. His prevalent studies within the technology sector (both hardware and software) underpinned an entire methodology that advancements surrounding software progression can assist the streamlining of analyzing tight tolerance commodities within Artificial Intelligence. Today, he is located in Los Angeles, California enrolled in a Science, Technology & Society program at the California Polytechnic University, researching Artificial Intelligence. An advocate proponent of technological furtherance, he develops with an emphasis on user experience and client-side platforms. In the course of mid-2016, his niche was further expanded to advancing complex mitigated business information and tethering them into wholly consolidated usable data. Albert is an avid automotive enthusiast and enjoys attending concourses throughout the west coast, holds numerous positions with organizations such as the Southern California Viper Club (Information Systems Director, 9+ years), was the national treasurer for the university and young professional non-profit organization ‘Lebanese Collegiate Network’ (universities include: Berkeley, Georgetown, Harvard, UCLA, University of Michigan, USC, and more) enjoys participating in autocross, kickboxing, fashion shows, and cycling. Serving as Vice Chairman of the Alpha Gamma Sigma Honor Society, he began his degree of volunteered efforts during the beginning of 2006. He is particularly fond of contributing his time to local organizations such as the American Red Cross Disaster Relief Services, Cruise4Kids, Motor4Toys food and toy drive and the Boys and Girls Club of America; in addition to multiple local contributions throughout the seasons. The latest few years of his life has been heavily devoted to solving the breakthrough of Superintelligence using the quantum bit computer architecture. Progress regarding this concept continues. Lance Kouchi enthusiastically lead our Club from 2010 to 2013. His modern vision and energy created new approaches to the Club. In 2012 Lance lead the Club to the last great VCA National event, VOI12, in Charlotte, North Carolina and in 2013 he organized the last VCA Western Zone Rendezvous at Fess Parker Resort in Santa Barbara that included a cruise to the Ronald Reagan Library & Museum in Thousand Oaks for a wonderful dinner and tour. Other memorial events were Holiday Parties at The Malloy Foundation Historic Race Car Foundation and The Queen Mary. During his term, Lance continued to build up the Sidewinders Track group with race days at Willow Springs and Spring Mountain. Lance, a master woodworker, always wowed us with his originally designed awards and raffle items for the club. With his wife, Cathy’s, help and expertise, the SoCal Viper Club continued to grow and improve. Their primary objective was to mix up the events and try to make every event fun. They held events that centered around the car, its owner’s desires and the Viper’s incredible performance capabilities. A few of these events were visits to places such as Saleen Motors, HRE Wheels, Meguiars, Mopars at the Strip, Viper Days, Coronado Festival of Speed, Barrett Jackson, Chip Foose’s shop, and Dyno Days at DC Performance, which became an annual event. Their most memorable events were the trip to Hearst Castle, the visit at Camp Pendleton Marine Base and the Western Zone Rendezvous that they organized in Las Vegas. Their annual Car Control Clinic became the most fun event of the year, and the annual picnic and Christmas party were favored events. Due to the individualistic nature of each Viper owner, Dan often remarked that organizing a bunch of Viper owners could be a lot like “herding cats”. Cathy brought the Club’s quarterly magazine back to life to improve communication with the membership and to help get vendors involved with our group. They re-worked the club’s website to enhance future club communications. Dan’s favorite part of the Viper ownership experience is driving the car fast and safely, and sharing that knowledge with club members. The Sidewinder Track Group was created under Dan’s efforts in 2009; at the end of 2010 it was 50 members and growing! Tony and his wife, Sherrie, understood that one of the reasons people joined the club was to get together with other Viper owners, and to have a reason to drive their cars. His main objective as President of the SoCal Viper club was to have more events; at least one per month. 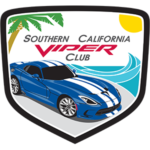 This tradition has continued over the years, and continues to bind SoCal Viper Club members into an active group with a wide range of social and racing events. Although Greg was a “track rat” and enjoyed all of the Club sponsored track events, he and his wife, Melanie, focused on bringing a better balance to the Club’s events. They added annual picnics and a few other family-friendly events. In 2003 they introduced a nautical theme, starting with the Western Zone Rendezvous at the Queen Mary in Long Beach. They also had a floating Christmas party on board the œIcon motor yacht in Newport Beach. Through their efforts, the reach of the SoCal Viper Magazine was expanded. Doug and his wife, Myrna, continued to build interest in racing at the tracks and scheduled several events for the Club members. He was instrumental in getting the NHRA to accept the Viper on the drag strip. The Ten and Eleven Second Club was formed and our members have pushed that to now include and Eight and Nine Second Club. Doug was the founder of the Viper Review and encouraged vendors to advertise in the magazine. He saw the value of being able to communicate to members via e-mail and encouraged members to give the Club their e-mail addresses. He had Ron Levy help improve the website. By 2002 the Club now boasted about 400 members. Bill started the website and continued to help the SoCal Viper Club grow. He went on to become a Western Zone Director and was instrumental in creating the first Zone Rendezvous in 2001. Paul merged the two local Viper Clubs into a VCA recognized SoCal Club, then went on to become a Western Zone Director in charge of Regional Presidents from 1999-2001. Paul had always been a car guy, owning a variety of interesting cars, but nothing prepared him for what he saw the first day of 1996 at the San Diego International Autoshow. Up on a raised, rotating platform was a spectacular blue with white stripes Viper GTS which took his breath away. As he gazed upon this car, he quickly realized that it had taken all of the oxygen out the auto show floor; there were more people gathered around this one display than the rest of the show combined! Shortly after the show he attempted to order a Viper from a Dodge dealer, finding out that this was a special production and available only to those who had previously purchased earlier models. Now, desperate to have one, he discovered Maurice Liang in San Francisco, who had founded the Viper Club of America. Maurice knew about a coupe that was mired in a bankruptcy. Paul flew to San Francisco, purchased the Viper and upon returning home, his neighborhood went wild. Paul has enjoyed success at his track events and the social events and runs are also a favorite of his. He is pleased to know that some of his best friends have come from the Club. ARE YOU READY TO BECOME OUR VIPER FAMILY?